The Wells Fargo California ATM and Alternative Format Settlement Agreement was the first in the United States in which a bank made a state-wide commitment to install Talking ATMs. The Agreement was negotiated by Lainey and Co-Counsel Linda Dardarian using Structured Negotiations. Claimants in the case were the California Council of the Blind and the four blind community representatives mentioned in the Agreement. In addition to Talking ATMs, Wells Fargo agreed to implement a comprehensive alternative format program to ensure effective communication of print materials to its blind and visually impaired customers. This Settlement Agreement (”Agreement”) is entered into this 1st day of November, 1999 (”Effective Date”) by and between the following parties: Kathleen Martinez, Jose Nieves, Ronald Brooks and Don Brown (collectively the “Claimants”) and California Council of the Blind (”Council”) and Wells Fargo Bank, N.A. (”Wells Fargo”) for the purposes and on the terms specified herein and operates in conjunction with the confidential portions of this Agreement. A. Each of the Claimants is an individual who is blind or vision-impaired and who currently has, had in the past, or would like to have one or more bank accounts with Wells Fargo or would like to use a Wells Fargo Express automated teller machine via a network system. Each of the Claimants is an individual with a disability within the meaning of Section 3(2) of the Americans with Disabilities Act, 42 U.S.C. §§ 12101, 12102(2) (”ADA”), the regulations implementing the ADA contained in 28 C.F.R. §§ 36.101, et seq. (”ADA Regulations”), and the laws of the State of California, including the Unruh Civil Rights Act and Disabled Persons Act (Cal. Civil Code §§ 51, 54.1), Health and Safety Code §19955 and the California State Accessibility Standards contained in Title 24 (collectively referred to as the “State Acts and Regulations”). B. Council is a non-profit corporation that provides advocacy services on behalf of blind and vision-impaired persons in the State of California, is dedicated to promoting the well-being of blind and vision-impaired persons, and provides information to the general public about the accomplishments, needs and contributions of blind and vision-impaired persons. Council is incorporated and has its place of business in the State of California. Among Council’s members, and those on whose behalf it advocates and provides services, are many individuals with disabilities who hold bank accounts with Wells Fargo or who hold bank accounts with other banks and would like to utilize Wells Fargo automated teller machines to access those accounts. C. Wells Fargo is doing business in the State of California. Wells Fargo owns, leases or operates banking facilities that are considered to be public accommodations (42 U.S.C. § 12181(7)(F)), subject to the provisions of Title III of the ADA (42 U.S.C. §§ 12181, et seq. ), the ADA Regulations, and the State Acts and Regulations. D. Wells Fargo provides printed material to its California customers and makes available numerous Express Automated Teller Machines in the State of California. E. A dispute has arisen between Claimants and Council, on one side, and Wells Fargo, on the other side, concerning whether Wells Fargo is providing Claimants, Council members, and other blind and vision-impaired persons with legally required access to its printed materials and ATMs in the State of California. F. Wells Fargo presently provides Braille instructions to offer additional information for blind and vision-impaired individuals regarding the use of certain ATM functions that cannot be accessed by telephone. Braille is a recognized auxiliary aid under 29 C.F.R. § 36.303(b)(2). Wells Fargo’s principal ATM vendors are developing a new combination of hardware and software technologies that has not been commercially tested in the United States to provide instructions for the use of certain ATM functions through voice guidance based on pre-recorded messages. This combination of technologies has not been previously available for use in the Wells Fargo ATM environment. G. The parties enter into this Agreement in order to resolve the dispute that has arisen between them and to avoid the burden, expense, and risk of potential litigation. In entering into this Agreement, Wells Fargo does not admit, and specifically denies, that it has violated or failed to comply with any provisions of the ADA, the State Acts, any regulations or guidelines promulgated pursuant to those statutes, or any other applicable laws, regulations, or legal requirements. Neither this Agreement, nor any of its terms or provisions, nor any of the negotiations connected with it, shall be construed as an admission or concession by Wells Fargo of any such violations or failures to comply with any applicable law. Neither this Agreement, nor any of its terms or provisions, nor any of the negotiations connected with it, shall be construed as an admission or concession by Claimants or Council with respect to technology, the requirements of any applicable law or Wells Fargo’s compliance with such applicable law. This Agreement and its terms and provisions shall not be offered or received as evidence in any action or proceeding, other than a proceeding to enforce the terms of this Agreement, to establish any liability or admission on the part of Wells Fargo or the existence at Wells Fargo or its Express ATMs of any condition constituting a violation of or non-compliance with the ADA, the State Acts, or other applicable law. 1.1 Americans with Disabilities Act. “Americans with Disabilities Act” or “ADA” means the Americans with Disabilities Act of 1990, 42 U.S.C. § 12101, et seq., and the Title III implementing regulations, 28 C.F.R., Part 36, including Appendix A, the Standards for Accessible Design (hereinafter “Standards”). 1.3 Auxiliary Aids and Services. “Auxiliary Aids and Services” means qualified readers, taped texts, audio recordings, Brailled materials, large print materials, or other effective methods of making printed materials available to Persons with Vision Impairments. “Core Functions” means (i) transfers between a user’s Primary Accounts; (ii) deposits, cash withdrawals, and stamp purchases from a user’s Primary Accounts; and (iii) cash withdrawals and stamp purchases from a user’s credit card account when the ATM is accessed through the user’s credit card. “Counsel” means Saperstein, Goldstein, Demchak & Baller, The Law Office of Elaine B. Feingold, The Disability Rights Education & Defense Fund, Inc., and the attorneys practicing law therein. 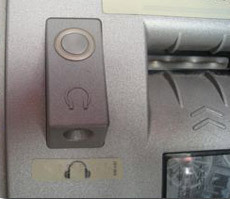 An “Enhanced ATM” means a Wells Fargo Express Automated Teller Machine that is equipped with a voice guidance system containing the following features: (1) the voice guidance system will deliver, through an easily locatable earphone jack and a private listening device, prerecorded instructions for Core Functions, but only to the extent that the particular Core Function to be accessed is available at the particular ATM Location to users without vision impairments; (2) the numeric keypad will be programmed to enable the performance of all Core Functions when the voice guidance system is activated; (3) the numeric keypad will have an “echo” effect such that the user’s numeric entries are repeated in voice form, except for the entry of a personal identification number; and (4) the voice guidance system will provide sufficient information to enable the user to review and correct entries without canceling the entire transaction to the same extent that sighted users of the ATM can so review and correct entries for the particular transaction. “Existing ATM Locations” means all Wells Fargo Express ATM Locations in the State of California existing as of the Effective Date. Wells Fargo will provide Counsel with a list of Existing ATM locations. 1.8 Persons with Vision Impairments. “Persons with Vision Impairments” means individuals who are blind or have central visual acuity not to exceed 20/200 in the better eye, with corrected lenses, as measured by the Snellen test, or visual acuity greater than 20/200, but with a limitation in the field of vision such that the widest diameter of the visual field subtends an angle not greater than 20 degrees. “Primary Accounts” means the designated primary account of each of the following types of accounts: (i) consumer checking; (ii) passbook savings; and (iii) market rate accounts, but only to the extent that the particular Primary Account to be accessed is available at the particular ATM Location to users without vision impairments. 1.10 Subsequently Acquired ATM Locations. “Subsequently Acquired ATM Locations” means ATM Locations owned, leased or operated by Wells Fargo in California for the first time after the Effective Date. 1.11 Wells Fargo Express Automated Teller Machine or Express ATM. “Wells Fargo Express Automated Teller Machine” or “Express ATM” means a self-service card accessed electronic information processing device owned, leased or operated by Wells Fargo and installed in public locations for the primary purpose of conducting certain financial transactions directly through the devices. Such financial transactions may include one or more of the following: dispensing cash, accepting deposits, and processing other routine banking transactions for its customers, and for dispensing cash to ATM card and credit card account holders of other financial institutions that settle such transactions via various ATM and credit card networks. 1.12 Wells Fargo’s 24-Hour Telephone Banking. “Wells Fargo’s 24-Hour Telephone Banking” means both the automated and agent- or operator-assisted toll-free telephone banking customer service that Wells Fargo provides to its consumers 24 hours per day for conducting banking transactions and obtaining information. This Agreement shall apply only to Wells Fargo’s provision of Express ATM services and printed materials within the State of California. The term of this Agreement and its provisions shall remain in effect from the Effective Date to the earlier of: (i) the completion of the Rollout Program described in Section 3, below; or (ii) five (5) years after the Effective Date, unless sooner terminated or modified by the parties pursuant to Sections 7 or 8 herein. This document is the settlement agreement with Wells Fargo about Talking ATMs in California. The agreement is also about braille and large print and audio banking documents. Wells Fargo was the first bank in the United States to install Talking ATMs all over a state. Lainey Feingold and Linda Dardarian were the lawyers for the blind community. No lawsuit was filed. Instead, a formal process known as Structured Negotiations was used. The California Council of the Blind was involved.